The 2019 Distributor Training Expo is SOLD OUT! Welcome to the Distributor’s Website for the 2019 CVSN/GenNext Distributor Training Expo. This website will provide you a quick and easy registration process as well as a home base for all other Expo information. April 26 – 28, 2019! Check out highlights from 2018! If you would like to be added to the waiting list, please fill out the short form below and we will notify you if a spot opens us. HOTEL RESERVATIONS: Hotel rooms will be reserved for all distributors that register through the on-line registration system. Approximately two weeks prior to the event individual hotel confirmation numbers will be sent out to each distributor via e-mail. GRATUITIES: Gratuities for all services and activities as outlined in the itinerary have been included for you. Gratuities for services you may receive on your own are at your discretion. REGISTRATION DESK: During your stay at the Hyatt Regency Atlanta, the CVSN/GenNext Registration Desk will be available to help make your stay more enjoyable. Stop by for any assistance you may need during the program. PERSONAL INCIDENTAL ACCOUNTS: The Hyatt Regency Atlanta will establish an incidental account for you for items of a personal nature such as gift purchases at the hotel, phone charges, laundry, room service, etc. These items will be at your own expense and may be paid by you at check out by cash or credit card including American Express, Visa, MasterCard, Diner’s Club and Discover Card. Do NOT use a debit card. ITEMS NOT INCLUDED IN YOUR PROGRAM: Items of a strictly personal nature, such as laundry, medication and telephone calls. Taxi, bus, optional tours and entertainment that you may elect to take on your own that are not listed in the itinerary. Any expenses associated with deviations from the scheduled meeting dates. If you are driving to Atlanta, Georgia please contact Jessica for parking instructions. Once airline tickets are booked they are non-refundable and non-transferable per airline rules and regulations. Any changes needing to be made to an airline ticket after purchase will be at the expense of the individual. TRAVEL FORMS AND AIR ITINERARIES: Please register for the trip at on the “Registration” tab to confirm your reservation. Upon receipt of your registration, an air itinerary will be sent to you via e-mail for you to review and approve. Once you have approved your airline reservations, any changes made will incur change penalties and may result in additional airfare charges for which you will be billed. If you have any questions, please call your CVSN/GenNext Travel Coordinator at 913-438-2600. IMPORTANT: You will need to respond to MTI’s Air Department’s e-mail to CONFIRM your airline ticket. TRAVEL DOCUMENTATION: A photo identification is required for all passengers for airline travel. Please carry them on you and not in your checked luggage. All travelers: Please be advised that the name on your airline ticket must exactly be the same as the name on your photo identification. If these names do not match, you will likely be denied boarding by the airline. AIRLINE CONFIRMATIONS: Your airline ticket confirmation numbers will be sent to you via e-mail from MTI’s Air Department. Please use these numbers to check-in on-line 24 hours in advance of your flight. LUGGAGE ALLOWANCE: Airline travel regulations vary regarding the number of pieces of luggage you may check and the cost per bag. Should any of your bags exceed the 50 pound weight restriction imposed by the airlines, you will incur additional charges. In addition, only one carry-on bag is allowed per passenger, plus a personal item such as a purse, camera bag or laptop. Carry-on bags must fit under a seat or in an overhead compartment. Golf bags are considered one piece of checked luggage. SECURITY AND PACKING GUIDELINES: Airport security measures differ from one airport to another around the world. However, some general guidelines should be followed. Be sure to arrive at the airport at least 2 hours prior to departure, allow ample time to clear security screening at your airport and expect to encounter more than one security checkpoint at all airports. Airlines are requiring that you present yourself at your departure gate 45 minutes prior to departure. In addition, some airlines are refusing to accept checked luggage less than one hour prior to scheduled flight time. Do NOT pack any sharp objects in your carry-on luggage or they will be confiscated by security. Items such as pocket knives, tweezers, disposable razors, metal nail files, etc. must be packed in your checked luggage. All liquids and gels in your carry-on must be less than 3 oz. (100 ml) and fit in a one, plastic, one-quart, zip-top bag. LAPTOP COMPUTERS AND ELECTRICAL EQUIPMENT: Laptops, expensive jewelry and other electronic equipment are attractive to thieves. It is imperative that you carry these items on your person and not in your checked luggage. Regretfully, CVSN, GenNext and MTI cannot assume responsibility for these items in your luggage. Additionally, most airlines do not replace these items if lost. Simply stated, do not give these items to bellmen, skycaps or anyone else. Please click HERE for a detailed agenda! The organizers of the Distributor Training Expo (DTE) CVSN and GenNext, are proud to announce that Dr. Albert D. Bates will Keynote the 2019 DTE in Atlanta, Georgia April 26 – 28, 2019. 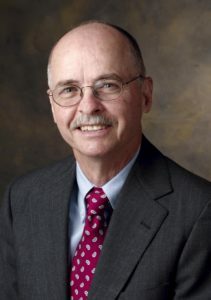 Dr. Albert D. Bates is a Principal in the Distribution Performance Project, a research group devoted to distribution issues. Al makes approximately 50 presentations each year on topics such as Improving the Bottom Line, Getting Serious About Profit, Doing More with Less, and Pricing for Profit. He is also a featured speaker at the University of Innovative Distribution. He has written extensively in both the professional and trade press, including the Harvard Business Review, the California Management Review and Business Horizons. Al received his undergraduate degree from the University of Texas at Arlington and his MBA and doctorate from Indiana University. While at Indiana he was one of the first recipients of the Ford Foundation Fellowships in Business Education. He is married and has three grown daughters. When he is not traveling giving seminars he enjoys tennis and skiing. He is not particularly good at either one. Nothing happens until somebody sells something. This has always been true and always will be. The problem is that some of the things that happen when somebody sells something are bad rather than good. This session will focus on how to ensure that every sales is profitable. It will highlight two key issues—order economics and gross margin maintenance. Order economics means ensuring that every order has enough gross margin built in to cover the costs of servicing the order. This is accomplished by ensuring that every order involves a “would you like fries with that?” approach and making sure that pricing of individual items is correct. If these concepts and ideas are applied correctly, firms can increase their profitability—not just a little but a lot. It should be a session that changes your ideas about sales. Only 10% of All Companies Produce a Great Profit – What’s the Problem? Focus on profit not sales. Don’t cut prices – ever. Have a plan, not a meaningless budget. The 2019 Sponsorships are Sold Out! Illinois Auto Truck Co, Inc.
2019 Distributor Attendees Coming Soon!